i really liked this whole conversation. amelia (i think), you were talking about how important it is that god has a body. i've always wanted to get away from my body, and i guess somehow i hoped that after i died i wouldn't have a body anymore. i get that joseph smith says he saw jesus and god with bodies, but ... i'm not even sure what i'm trying to ask here. anyway, great podcast. i'd like to hear more about the non-mother roles of goddess, if you do another one. Anonymous, I can understand wanting to get away from your body. I don't know your particular circumstances, but I do know some people who have had to battle their bodies in this life and the idea of being saddled with it in the next life is not very welcome. The scriptures do establish that God has a body (D&C 130:22), so I think that it's unavoidable that we also will have our bodies when we achieve exaltation. I personally think it's a pretty vital Mormon teaching because it helps us (theoretically) get away from the idea that our bodies and their drives and passions are sinful. I really dislike the tendency to draw stark distinctions between the purity and holiness of the spirit and the baseness and sinfulness of the body. I think it's especially important for women since so much shame is so often attached to the female body, especially in religious cultures. I like being able to claim my body as an integral part of my soul (the Mormon church teaches that the soul is comprised of the body and the spirit united). It's empowering for me. Though I completely understand how that might not be true for all people. The scriptures do say that after the resurrection our bodies will be perfected. I don't know exactly what that means; I do think it means, however, that our bodies will not be problematic for us after the resurrection but instead will empower us and bring us joy (which is how I try to see my body now--as a source of empowerment and joy). Anyway. Thanks so much for listening and commenting. I agree with you that it would be really great to delve into the non-mother roles of Goddess in more depth. As a single childless woman, that aspect of who she is is very important to me. My observation on the praying to Heavenly Mother (and having read that talk from then-Elder Hinckley): He said "scripture shows this example" (ie, all male). Then he said "I think it makes sense to follow the example we've been shown." I know that everyone has taken that to mean that we should not pray to Mother. But upon careful reading, and careful consideration, I think he was saying "hey, I don't know, but here are the examples I see in scripture, so this is what I think it means, and this is what I recommend if you're asking me..."
I think that if you, personally, feel a desire to pray to Mother, then you have every right to it. Personally, I have not felt that need or desire. I've considered it, but I'm actually not one who is really big on formal prayer in general...we do for meals (for the formality of the gratitude), but most of the rest of my praying is "in my heart" or via meditative types of things. So, with what Jenni is saying ... do any of you know any instances in the scriptures (I'm not very well-versed in the OT) where something could be seen as a prayer to Heavenly Mother or Sophia or anything like that? "However, in light of the instruction we have received from the Lord Himself, I regard it as inappropriate for anyone in the Church to pray to our Mother in Heaven." While I think your reading of the sentence you quote is a plausible interpretation (though a little bit of a stretch) of that particular sentence, I think it's pretty hard to get away from the fact that in this other statement (that I quoted) President Hinckley very clearly states that it is not okay to pray to God the Mother. To be clear, I personally think that people should pray in whatever manner works best for them. I think arguing that the example we have in the scriptures is exclusively of praying to God the Father is a lousy explanation for why we should not pray to God the Mother. The absence of women in historical records (including the scriptures) is more indicative of the nature of the society in which those records were made than it is an accurate representation of what is Right and Wrong. Tansy, I don't know of any scriptural passages that could be interpreted as praying to God the Mother, though I'm not exactly well-versed in the OT. Anyone else have thoughts on that? Thank you for such an interesting discussion. 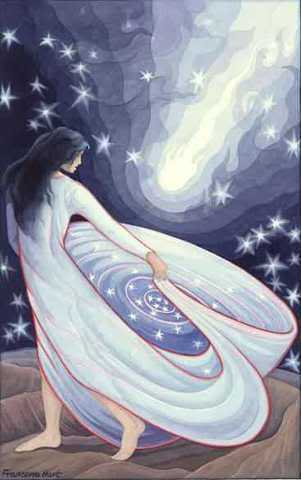 It is boggling to think that understanding the divine feminine is not pertinent to my salvation. Rather,I believe it is the essence of my salvation. What exactly will I be doing in the next existence? Why bother working so hard to get to the celestial kingdom? I was taught that I was to be the "heart" of the home and raise my children (especially sons) to be righteous. Yet as mortal children, we have no communication with a heavenly mother, only a heavenly father. Has heavenly father usurped heavenly mother's role? If so, apparently there is no innate need for a mother beyond being a womb. So again I ask, what exactly will I be spending my eternity doing, breeding? The church has a lot of rhetoric about the importance of intact two parent families, but in this existence, we seem to be in a single parent existence. And daddy seems to favor the boys... Well, talk about injustice. And we all know that justice cannot be robbed. And as far as not speaking of heavenly mother to prevent us from defiling her, this conjures up the image of a rather frail divinity. Will she come down with a case of divine "vapors" if things get a little intense? This idea of the feminine is a little antiquated. My idea of a heavenly mother is less like June Cleaver and more like Roseanne Barr. Cam, I laughed out loud at the image of "divine 'vapors'"--hilarious. When you stop and think about the notion that our Goddess must be protected, it rapidly becomes apparent just how dumb that idea is. I loved the point Juliane made (I think it was Juliane) that she as a mother is hurt when her children say thoughtless things (as all children are wont to do at some point), but that doesn't mean she can't deal with it. Why would Goddess be any different? Cam, I think it says a lot when people give the excuse that Heavenly Mother needs to be protected from having her name defiled. Are those people saying they could do or say anything that could shake a perfect, powerful, loving Goddess?? Ridiculous indeed. I had a very hard time with President Hinckley's words on Heavenly Mother. At least two of my blog posts are my efforts to grapple with what seems like a case closed argument that if you pray to Heavenly Mother you are disobeying a prophet of God. Yet, there are also two references that I find helpful in determining whether that counsel can/should be followed. First is the LDS newsroom 2007 press release called "Approaching Mormon Doctrine" which states that not everything a prophet says is revelation and that what a prophet says trumps what an apostle says. Like was said on the podcast, Hinckley was speaking at the time as an apostle and not prophet of the church (though Amelia brought up the good point that effective he was Acting President of the Church). The other reference that is applicable in this is the Mormon Matters post on "10 Things Every Mormon Should Know" particularly point 4 (which also references the press release). Then also is the belief that in order for us to know that something is true, we are counseled to pray "to know the truth of these things." We are also counseled to pray to confirm what our leaders teach us to be true. Therefore, in order to know whether President Hinckley was right and that we should NOT pray to Heavenly Mother it is appropriate that we may pray to Heavenly Father to know directly His will. So if prophet trumps apostle, then Spirit trumps prophet. That is the necessity of personal revelation: to know what is right for ourselves. So that's my answer: want to know if its right to pray to Heavenly Mother "ask and ye shall receive." I want to post more thoughts later, but right now I just wanted to express my awe and reverence that I felt being in the presence of both the discussion about Heavenly Mother and the power of female voices which are almost always silenced or relegated to the background of established secondary roles. It was the auditory, theological, and emotional equivalent of staring up at a cold, clear star filled nighttime sky. Thank you for what you are doing. Thank Goddess. What a powerful and articulate panel. We men need our Mother too, and we need to hear women's voices. I just heard you mention that Goddess is not in the Godhead. My husband has suggested that Holy Ghost is an office and perhaps the office of Heavenly Mothers. Like there are LOTS of mothers in heaven, thus LOTS of Holy Ghosts. He is a believing, active Mormon and he is willing to think this is possible. This helps him. It did not do much for me but hey, if it helps one of you to perceive the Holy Ghost as a female then good for that. I have heard this before that the Holy Ghost is sometimes associated with a female Goddess, or even Heavenly Mother. It definitely would make more sense to me to have Father, Mother and Son, then Father, Mother and another unrelated personage in the Godhead. However, the whole more than one mother/polygamy in Heaven/Heavenly Father has multiple wives thing freaks me out. I loved this podcast and can't wait to listen to part two! At the beginning of the discussion it was mentioned that in ancient Hebrew the word Elohim is plural. It made me think that when we worship Elohim we are worshiping God and Goddess as two equal beings. They are one in purpose. When the Roman Church compiled the scriptures that we know now as the Old and New Testament, they did not understand this concept and wrote out our Heavenly Mother. They were trying to create something that didn't resemble paganism. Throughout the centuries it stuck. Western culture completely rejected the idea of a female deity and the LDS Church is following that tradition to seem more mainstream. This really saddens me. I want to know more about my Heavenly Mother because I am made in her image. She is what I hope to become one day. I miss her. I have an ache in my heart to see her once again. When my younger sister was very ill as a child she was given a priesthood blessing for healing. In that blessing she was told that her Heavenly Mother was very worried about her because she was so sick. Why would a priesthood holder be prompted to say that if we are not supposed to discuss our Heavenly Mother? She loves us and misses us and is concerned for our well fare. I really think that we need to pay attention to her. Thank you, thank you, thank you. You so succintly, voiced many concepts which I have been unable to. Finally, a place where we can talk about Heavenly Mother. I have waited years for this. Descent, isn't it frustrating that we're given so many messages and then we have to try to figure out who trumps who? Especially with Oaks' recent talk about the priesthood line trumping the personal line. Jared, thank you so much for your recognition of what we're doing here. Good question, Terry! Pretty much, I think all our ideas about what we'll be doing in the hereafter are just interesting (and sometimes horrifying) conjecture. Esther, thank you for sharing the experience about your sister receiving a blessing that said Heavenly Mother was concerned. It is so good to hear Her spoken of and hear Her speaking. Kelty, you are so very welcome! Thank you for coming here to help create this space with us. Are we going to get personal stories/histories from Katrina and Heather? Please? Yes, yes, yes! Most definitely, Liza. Heather's is now up (Replanting My Garden) and Katrina's will be coming as soon as we can find a recording slot. Is there a way to listen to this on my phone through a podcast app? You can google the type of phone you have and find apps, etc., that are specific to what you've got. Good luck! Is it not true that husband and wife must be sealed together to live in the highest level of the celestial kingdom? I just thought that Heavenly Father and Mother are a unit, sealed together. I think that we aren't meant to know much about her because perhaps it would be too complicated, too difficult to understand, or too easily distorted. I do know that the more holy something is, the less it is spoken of, such as the temple endowment. Isn't that why the Melchizedek preisthood is called that instead of it's former name? I think it's something about not making extremely holy things commonplace. Her. Somehow it doesn't fit with the organized model we've been given. I trust that our prophets know much more than I do about it, and I will follow them. I have prayed about Her at times. We can pray to Heavenly Father about anything that is righteous. What could be more righteous than expressing love and appreciation for one's Parents? Janet, thank you for your comment. To my understanding, current church teachings do say that to get to the highest level of heaven you need a temple sealing to your spouse. Like you, I've also thought of God as a couple, linked together. That's part of why all the emphasis on only one side (Father) hurts so much. Does this mean that after this life I would be eclipsed by my husband? And does this mean that having one's eternal children unaware of me would be acceptable? For my part, I think that the tilted emphasis is due to culture and tradition. Something you bring up puzzles me: Why would our Mother God be "too complicated, too difficult to understand, or too easily distorted"? Is there something in particular you are thinking about here? It seems that if Mother and Father God are sealed together as an eternal unit, that they are equally important and equally holy. If Mother is somehow more holy and therefore not spoken of ... well, this is highly problematic for me. I would be interested to hear more of your thoughts on this. Thank you for sharing that you miss Her and that you have prayed about Her. I love your final question: "What could be more righteous than expressing love and appreciation for one's Parents?" Beautifully said.